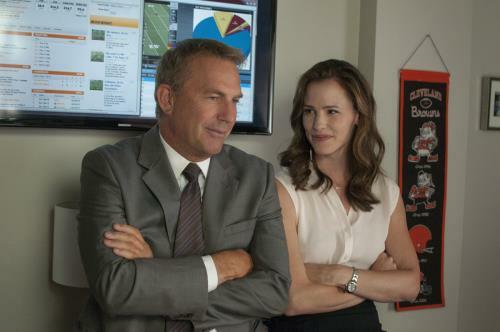 Not many other events in the sporting world generate as much excitement, prediciton and anticipation than NFL draft day, so it’s no surprise that staple sports actor Kevin Costner’s (Bull Durham) in the movie. Draft Day looks into the high-stakes world of the NFL Draft and shows how the lives of athletes and the fortunes of football teams can be changed forever on that one single day. Costner stars as General Manager Sonny Weaver Jr. who controls the number one pick. Up against fan pressure, an ambitious owner (Frank Langella, Muppets Most Wanted) and a hard-nosed coach (Denis Leary, The Amazing Spider-Man), Sonny faces the biggest decision of his life. Should he go with the consensus or trust his instincts and risk losing it all? Written by first-time feature film scripters Rajiv Joseph (TV’s Nurse Jackie) and Scott Rothman and directed by Ivan Reitman (Up in the Air), the R-rated film was made in exclusive partnership with the NFL, allowing unprecedented access to the actual 2013 NFL Draft, an event that drew higher ratings than the playoffs for baseball, basketball and hockey. Draft Day‘s cast also includes Jennifer Garner (Dallas Buyers Club), Sam Elliott (The Big Lebowski), Sean Combs (Get Him to the Greek), Terry Crews (The Expendables 2), Ellen Burstyn (TV’s Political Animals) and Houston Texans running back Arian Foster. The movie got mixed reviews from critics, with moviegoers scoring it a little higher, 62% compared to 71%, according to Rotten Tomatoes. Still, Draft Day didn’t exactly get a touchdown at the box office, grossing $29 million, that’s less than Costner’s action movie 3 Days to Kill, which got much less love from critics. We predict a better showing on disc. “Welcome to Primetime,” an inside look behind-the-scenes of the NFL Draft. Both discs also offer a downloadable digital copy of the movie.